I completed the HDipLIS in UCD in 2002 and later completed the MScILS via distance learning (Robert Gordon University). I’ve worked in a few different library settings, including a primary school, a commercial law firm, a third-level college and a VEC. I’m still not sure how I ended up in a music library and I’m sure my piano teacher would be even more baffled by it. She used to leave me alone in the room with her wee dog. After a while, even he was scratching at the door trying to get out! Because the library is small and there’s only 2 staff we both do a bit of everything so there’s a bit of variety – acquisitions, cataloguing, dealing with reference queries, helping the catalogue-phobes find what they need, trying to sneak useful information into the Facebook Page in between the funny pictures! I work in a fairly traditional library. Organising, searching and communicating are the core skills. I still catalogue from scratch too – that feels a bit retro. Some people probably still think of librarians as introverted types, but an interest in people is essential. I’ve worked in very different libraries with diverse library patrons. 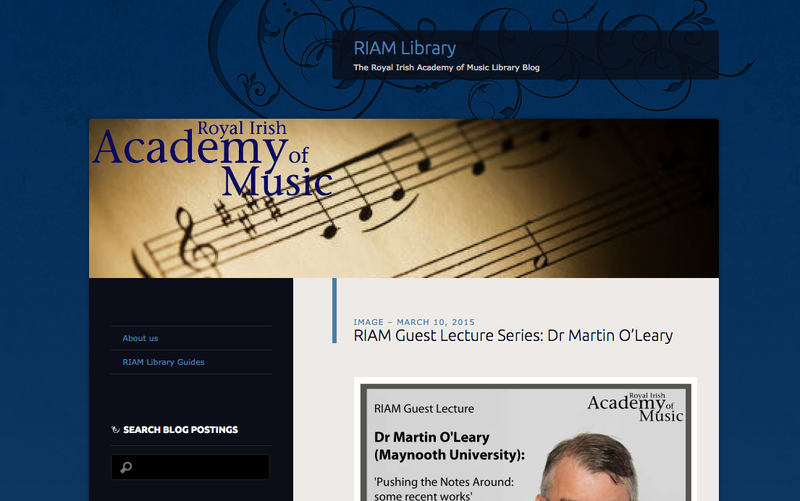 In the RIAM, the library users range from little five year olds who are attending pre-instrumental classes to Doctorate students who are professional musicians. (I probably have more in common with the five year olds). Communication and people skills are important for building relationships with faculty, students, library colleagues, management, etc. Project work and collaboration are becoming more of a feature of library work. Promoting the library – its services and collections – is also important. In this regard, a bit of creativity and humour never hurts – probably not the first words that spring to mind when you hear “librarian.” Given the many threats to the profession, I think it is really important that we engage in professional development, keep learning and up-skilling and keep advocating for librarians and their skills (both traditional and non-traditional). Are there are any specific software packages or technologies you use on a regular basis within your role? I’m afraid that we’re not exactly at the cutting edge of technology – no 3D printers churning out violins or anything! Our Library Management System is SirsiDinyx’s Symphony (very apt!). In the last few years, I’ve been getting into social media. The RIAM Library Blog and the online exhibition space, The Academy Remembers, are on WordPress and RIAM Library is on Facebook and Flickr. I’ve used Survey Monkey to get student feedback and Jing for screen-casting. Similar to many librarians, I enjoy bringing order to chaos (that’s my OCD talking) and connecting people with the information they need (or the information they don’t even know they need until they get it). I was delighted to work with RIAM Opera Development Officer, Kathleen Tynan, to create and develop the RIAM Opera Archive. I felt like I’d finally cracked it when one of the teachers said, “I liked your opera archive; maybe you could do the same for the performing groups.” Also, once in a while I manage to get a classical music question right on University Challenge and that makes me feel really brainy. For me, being a non-specialist in a specialist library has been very challenging. I still don’t really think of myself as a “music librarian”. I sometimes think that being a non-musician in the Academy is a bit like being the only Muggle at Hogwarts! When I mentioned this to one of my colleagues on the A&SL Committee, she pointed out all the important skills that we, as librarians, bring to any organisation and she recommended that I try to find my own particular niche. She’s definitely right, although some days I have the horrible suspicion that my niche might be unjamming the photocopier. Anyway, I can highly recommend a pep-talk from Niamh O’Sullivan if you’re feeling unappreciated. As everyone knows, library jobs have been a bit thin on the ground in recent years. There aren’t many dedicated music librarian positions out there. The RIAM only has a library staff of 2, so not many opportunities there! But then some public libraries have music collections, the National Library has a music collection and you can look at orchestras, archives, arts and cultural organisations, e.g. The Irish Traditional Music Archive, RTÉ and The Contemporary Music Centre. You can check out the IAML website for more information on music libraries. Professionally, one of the best things I’ve done in recent years is to join the Committee of the Academic & Special Libraries Section of the LAI. This has helped greatly with my professional development and given me a great network of colleagues. Be able to read music, play a musical instrument, have a broad knowledge of music history, composers, musical forms and genres, be able to speak about 5 different languages. Or if, like me, you don’t have any of that, be really open to learning!